Solandras are medium to large vines that can become shrubs if trimmed on a regular basis. The flowers are large and quite unusual. Normally they appear during the shorter days of the year, from November to April. Some varieties flower more than others. The flowers are fragrant, but the frangrance is only released at night. 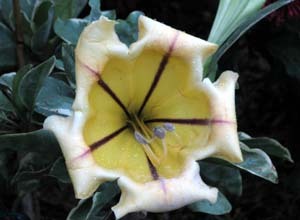 The flowers start with a white color and change to a deep yellow as they get older. The variegated form has green and white leaves and their new growth is magnificant, starting with a deep purple color. Solandras are tropical vines that like full sun to partial sun. They will tolerate light frost, but some protection may be necessary if the temperatures drops below 32° F. Solandras will grow fast during the warmer months and can be trimmed as often as necessary during this time. During the colder months, the plant slows down, therefore trimming is not necessary and that's exactly when the plant will produce its flowers. Solandras can be grown and will bloom well in pots.